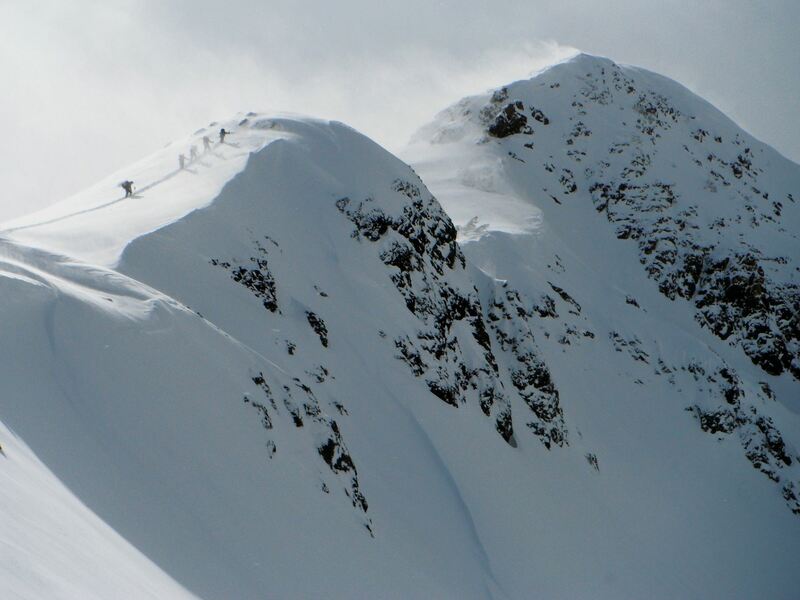 Ski Dreams is a couloir tucked in the Sawtooth Range almost next to Matterhorn Peak. In addition there are several options in the vicinity that combined with the long approach (5-6 miles) make for a nice multi-day trip. As the trip planning evolved, a storm popped in the forecast. After monitoring it the expectation was for very light snow, cold temperatures and mild winds. Given prior experience with the local weather it was best to prepare for worse conditions. The plan was on day 1 to hike in, setup camp and scout the area; on day 2 attempt Ski Dreams and scout other objectives (e.g. the Doodad); on day 3 attempt final objective and ski back to trailhead. On the approach it was a beautiful day, only made better due to the awesome snow coverage. Throughout the day winds started to pick up and around midnight snow started to fall. The forecast predicted 1-2" of snow at camp elevation (9.8k ft) but on the morning of day 2 it seemed that 5-6" fell overnight. Strong winds and light snow continued throughout the day. 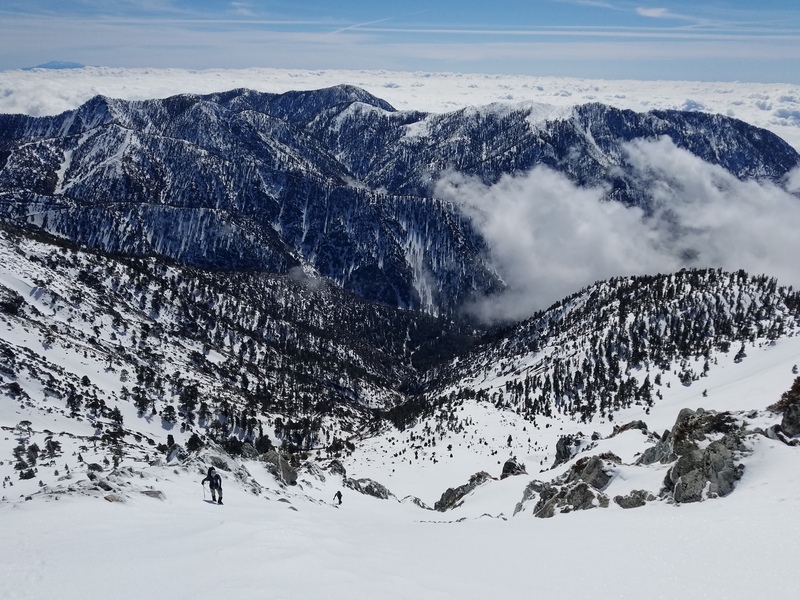 The group did a short tour on low angle slopes to assess snow stability and confirmed there were at least 6" of fresh, cohesive, and non-reactive snow over the older hard pack. This combined with poor visibility (~100 yards) made the group head to camp after enjoying a couple of laps. Hunkering down is not the most fun thing to do but in this case it was the safe decision. As the storm moved through the winds hit ~40 mph with ~60 mph gusts; enough to knock one over. Thankfully our camp was sheltered and secure. Overnight the winds and snow died down but the extra energy created dangerous wind slabs. After a good discussion the team didn't feel confident that the conditions were safe for a ski dreams push. We decided in spite of the beautiful blue bird day and fresh pow to pack camp and ski to the car. For some in the group this is the 3rd Ski Dreams attempt. But as they say, the mountain will always be there. On the plus side the ski out was wonderful and with the great coverage it was possible to ski all the way to the car without skinning. As the team headed out, there were a couple of parties heading for the couloir. Later at home we read that one of the parties triggered an avalanche, thankfully without casualties. I think we made the right call. No we're not talking morbid tales of demise, but rather snow protection. What do you know about how to use pickets, a bollard, or a snow seat to give your team some security in that couloir / glacier / steep face? Using specialized techniques and tools, any snow slope is not only climbable, but protectable. There are options beyond individual self-arrest, but it always involves a rope and some form of protection. But you can't just rope up like you would do at the rock crag and call it good. Climbing steep snow safely requires a bit more. First, some understanding about protection. Generally, snow does not provide the best options...rock protection is generally the strongest protection available. Ironically, it should be your first choice on a snow climb. That's one reason why it's a good idea to climb on the side of a couloir. Next best option is an ice screw, if you can get it, but that's rare. Next best is probably a natural anchor such as a large, well-rooted tree or a very large boulder, flake, or horn. If none of these options are available, then your next best strategies to protect yourself and the team on the climb are the usual tri-fecta of 1. snow protection, combined with 2. belayer positioning, and backed up by 3. an effective team self-arrest. Pickets are the universal choice here. The standard 1.5 foot T-shaped aluminum snow picket can be hammered in vertically, like a fence post (as a "picket") or buried horizontally in a T-slot (as a "deadman"). You will need a double length (48") sling or an attached cable to extend it for anchoring. Next best option is to use a mountain axe, also placed as a picket or a deadman, and you'll need to sling it as well by clipping to the head or using a girth hitch or clove hitch around the shaft. Once the axe is solid you can connect it to the picket(s) and begin creating your belay anchor. Other options include a snow fluke, a bollard, or any other object of some size that can be used as a dead man, like skis, snowshoes, or a pack. To learn more about this paid members can view Snow 3 online training. A bollard is also not used much but is great to know about and fun to use, if you have the time to dig one. It is a tear-drop shaped trench that is dug in the snow where the rope can be placed so that is in effect "lassoes" a big circular plug of snow. A bollard requires some practice to do well, but does enable you to use it as an anchor, or even rappell from it, using nothing but snow. Not sure if that is encouraging or not! This is what's called a "snow seat". It is a way of anchoring oneself while seated in the snow, feet wide and braced, in order to provide more strength to an often dubious snow anchor. Most often it is used at the end of a lead to bring up the team, but it can be used at any time, even in rock climbing, to add to the overall strength of a belay anchor. In snow climbing, if the team is belayed directly off the harness using a Munter Hitch, a device, or even a hip wrap, then the snow anchor components are usually equalized and the master point is attached to the belayer's belay loop to function as a backup to the snow seat. 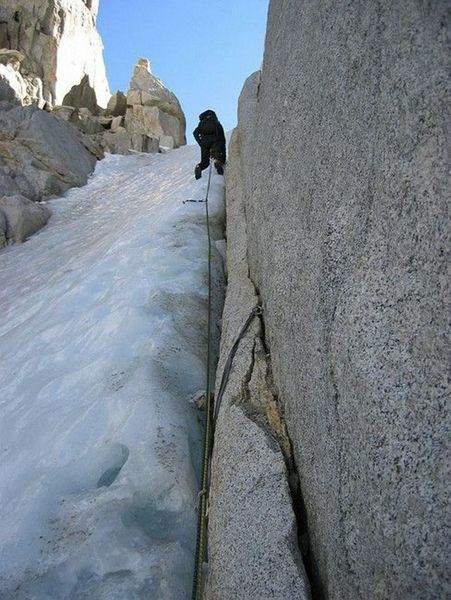 In this way belaying a team on the snow is often different than rock climbing: the belayer's position is considered the primary strength of the anchor with the various snow anchors components factored in as additional strength, and the team is belayed from the harness instead of from the master point of the anchor. 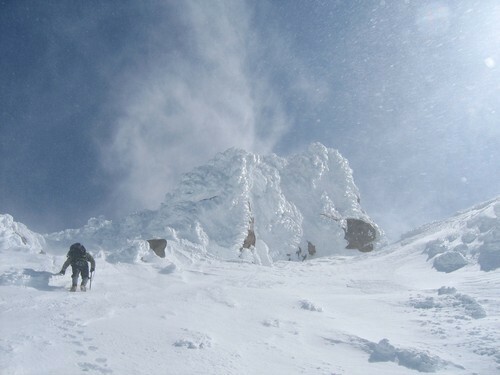 Most of the time snow climbs are done using a technique called a running belay or "simul-climbing". This is a technique where the entire team is spread out on the rope and all moving at the same time. The leader places protection at regular intervals and the last person on the team removes it, taking care to keep a few pieces attached to the rope at all times. If any member of the team falls everyone executes a self-arrest in response. This is the first line defense against injury. Secondly, the rope will come tight on the protection and that will add a level of security. But if protection fails, the team still has self-arrest as their primary risk management strategy. So as the first and the last resort, it must be done well! Learn More - all of these skills and techniques are taught in our Snow 3 and Snow 4 training courses being held in April and May. You can also learn more by watching the online video training and we have some applicable seminars on our YouTube Channel. After a winter in which Every. Single. Weekend. Seemed to bring another storm I was surprised to see clear skies and no wind in the forecast for our ascent of Matterhorn Peak March 15-17. Our seven-member team met at the end of Twin Lakes Road in Bridgeport at 9am, went over packs, distributed some group gear and made our way to Horse Creek Trail shortly after 10. God bless skiers and the boot-pack they provide. Right out of the gate the Horse Creek Trails hits you with an 800 vertical foot ascent and the prospect of going up that in unconsolidated snow was not something anyone had been looking forward to. However, the skiers got there before us and we were more than happy to use the steps they had kicked. 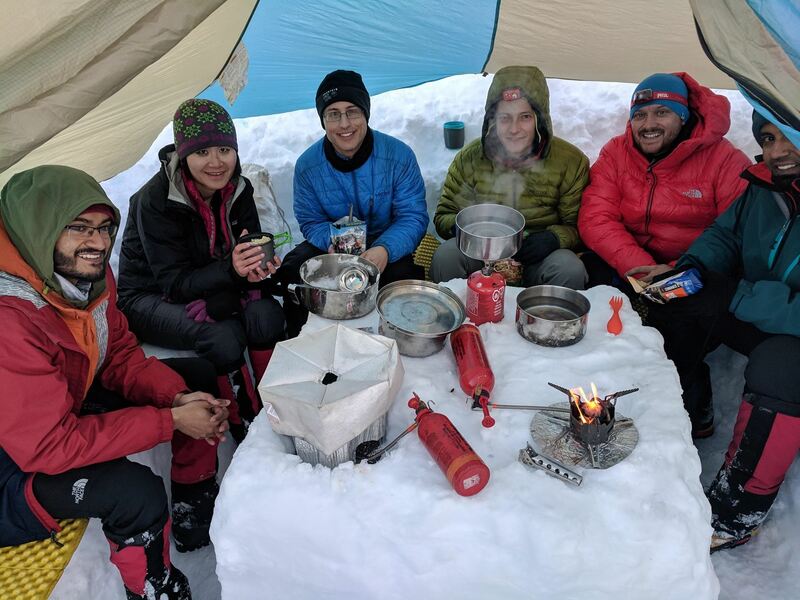 Temperatures were warm during the day; we snowshoed up to 10,200 feet picked a location for camp, dug out tent sites and set up a cooking spot in a grove of trees. While the day had been borderline hot and Mountain Forecast was calling for nice temps at night as soon as the sun dipped behind the ridgeline it got surprisingly cold. Nathan packed a few extra pounds of gear and was wandering around camp in a full down suit complete with down booties and seemed utterly unperturbed by the cold. While I can’t speak for others I, at least, was jealous. Of the seven members who camped that night two were feeling ill and opted not to continue, a third volunteered to stay behind and keep an eye on them (thanks Leslie!). Nathan, Aaron, Brett and myself were out of camp by 7:00 the next day, to the top of the east couloir by 10:00 (give or take) and on the summit by 10:30. Blanketed in snow from all those storms the view from the top looking south along the Matterhorn-Whorl ridgeline toward Yosemite was jaw dropping. The descent took a little longer than planned when we found the Ski Dreams couloir unusable and had to get back to camp via Horse Creek Pass. Walk back to the trailhead was uneventful and everyone reached their car by 11am the next day. Thanks to all our members for a great trip! 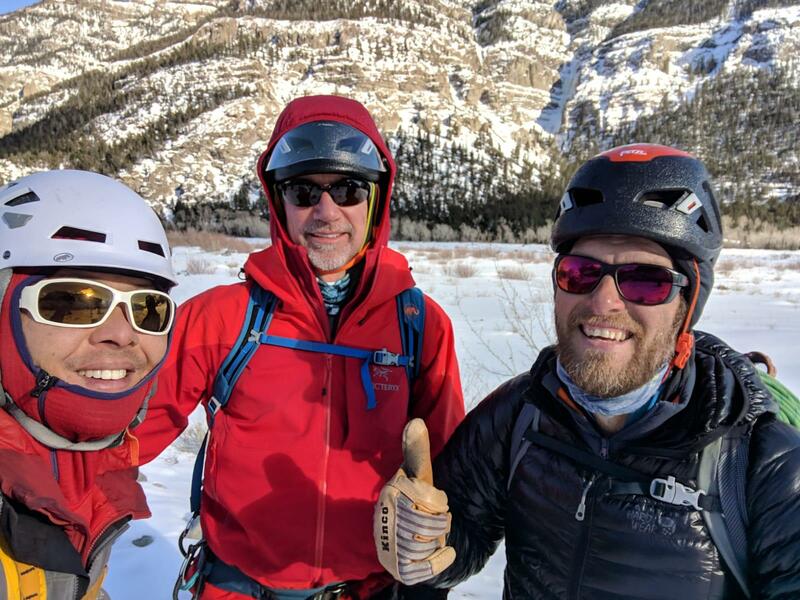 Our winter mountaineering training wrapped up with a stellar weekend of rappelling, traveling, and climbing on the Mountaineering Level 2 (MTN 2) Winter Mountaineering Course March 15th - 16th, held at Billy Mack Canyon near Truckee. Snow levels have been off the charts -- we got a chance to experience it firsthand. 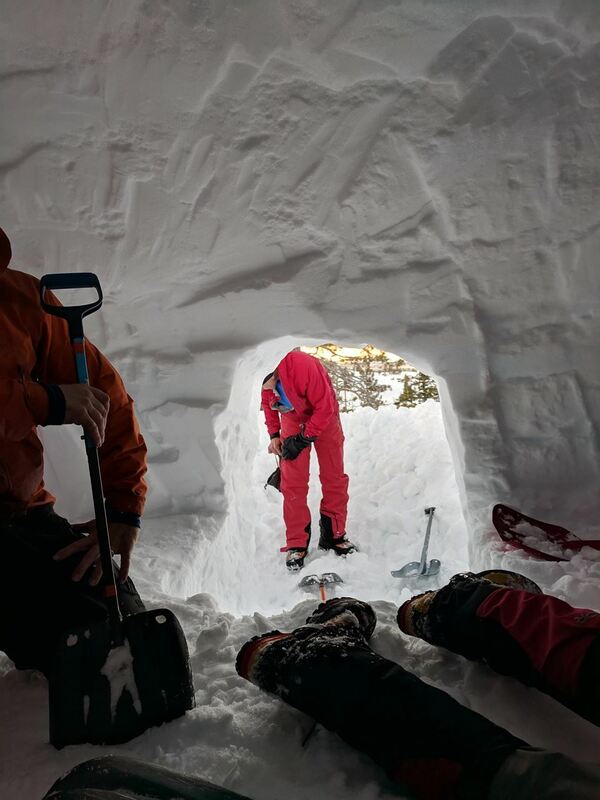 We had to dig our way through the wall of snow just to get started. Travel to basecamp was straightforward and pleasant, and in no time we were digging a snow cave, a quinzhee, setting up tents and a group kitchen area. A heck of a lot of digging. There was so much snow that we found drifts buried inside of drifts. The snow was somewhere around 10 - 15 feet deep everywhere, with incredible cornices. Our kitchen set up was a very nice place to spend the evening together enjoying meals and a mild winter night with about a billion stars. In addition to our winter camping and technical skills, we also spent quite a bit of time working on advanced navigation, learning how to shoot a bearing without using the needle and how to move through terrain when we can't sight a bearing to our destination. 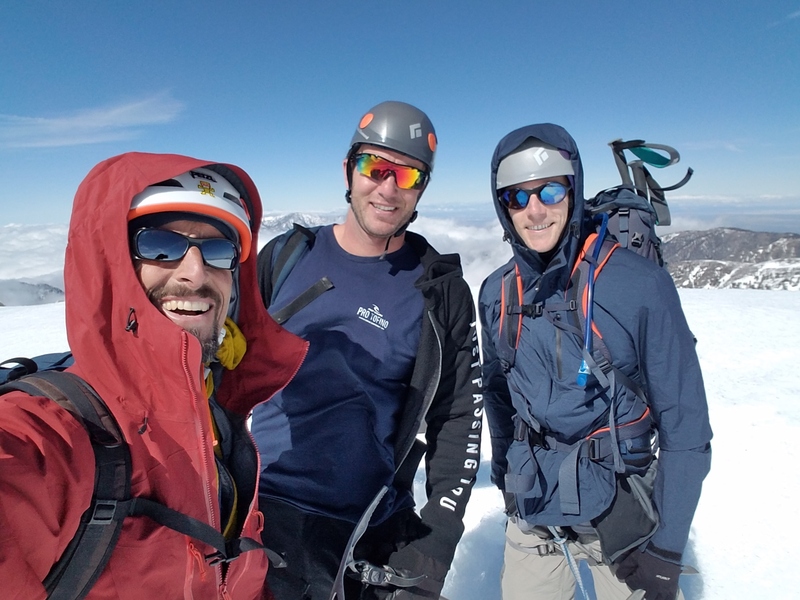 The mountaineering series continues with MTN 3, which is "Expedition Mountaineering" -- this is our most physically demanding training with a 24 hour circumnavigaton and technical climb, with a bivouac in the snow. Light and fast is the name of the game here, no basecamps. This is meant to prepare members for the final push to the summit, having the skills, technique and know-how for success. Thanks everyone for a successful and rewarding training! Let's start when it's too cold to rock climb anymore -- with freezing late fall and winter temperatures. 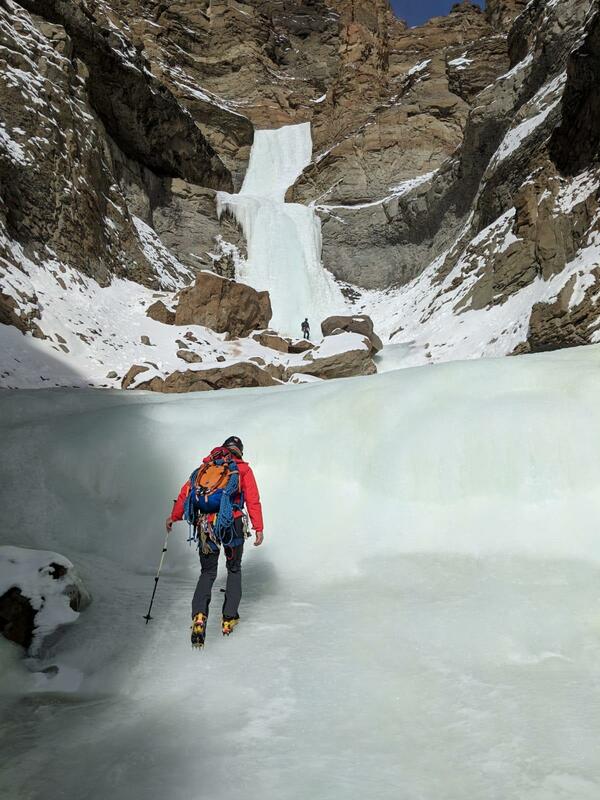 As the creeks and cascades harden, water ice climbing season begins, with the pillars, faces and gullies gleaming with hard ice. Lee Vining, June Lake, Ouray, Bozeman, Cody, Canada...we love it. We'll continue kickin' and pickin' steep and vertical ice through the winter using short-shafted "ice tools" with a reverse curve pick and sharp vertically oriented ice climbing crampons, from November to March. This continues while winter snow is falling readying for the "next season" of ice climbing, which is just around the corner. Sometime around April in the Sierra, as the water ice melts away, all that winter snow continues to condense and harden. About the time we no longer need those double boots, steep couloirs in the mountains are hard enough to climb. This is the "alpine ice" season a.k.a. as the time to climb Round Top, Tallac, Baldy, Red Slate, Mendel and the like. Specifically, this is "névé climbing", which is old snow that hasn't yet been around a year. 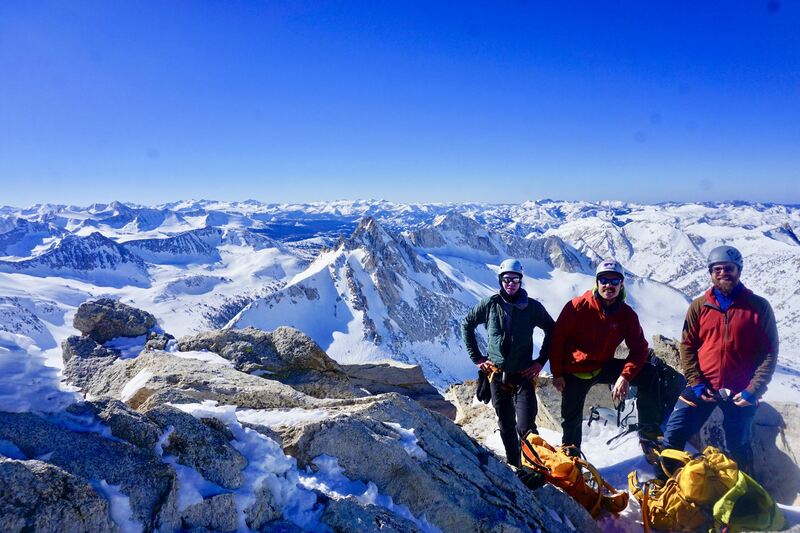 Névé has gone through enough freeze / thaw cycles that it can be climbed with two tools -- either a mountain axe and a ice tool, or two hybrid tools -- and rock pro and snow pro can be used as you simul-climb with your team for thousands of feet. 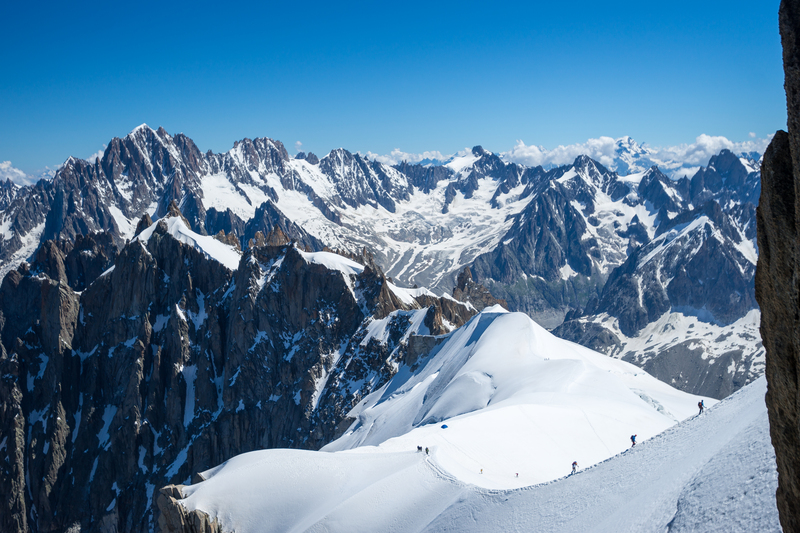 These couloirs and faces provide direct access to the glorious mountain summits. Days are longer and the high peaks are warmer - make sure you get an early start and are back to camp for a late lunch before the rocks and ice start coming down! Once the névé is hard enough to take an ice screw or very resistant to shoveling, it is classified as "firn" and is a dream to climb, because it takes picks with less effort than water ice and yet is very secure. 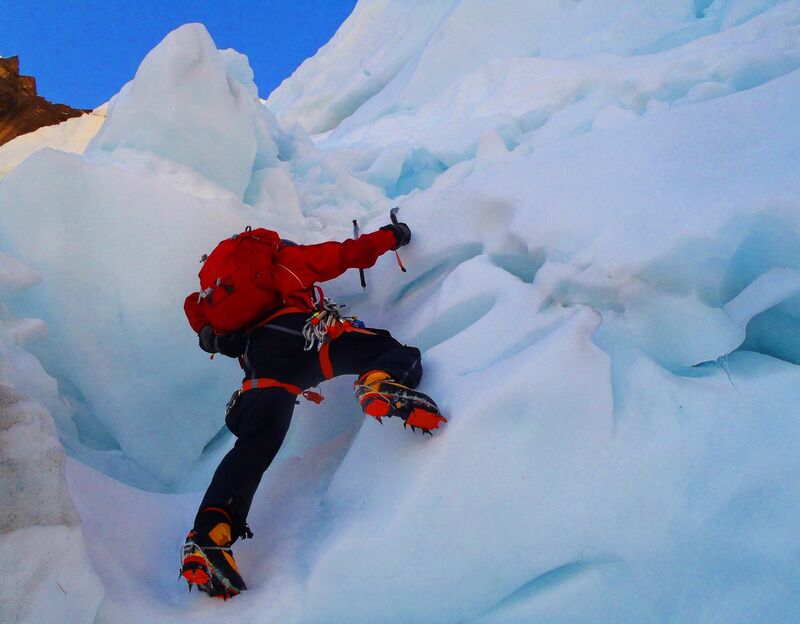 To climb alpine ice, the technique is a little different that water ice climbing. Typically a climber will keep their tools lower, climbing with them in low dagger, or mid-dagger position. This allows a climber to quickly and confidently crawl up steep snow slopes without having to use an overhead swing. 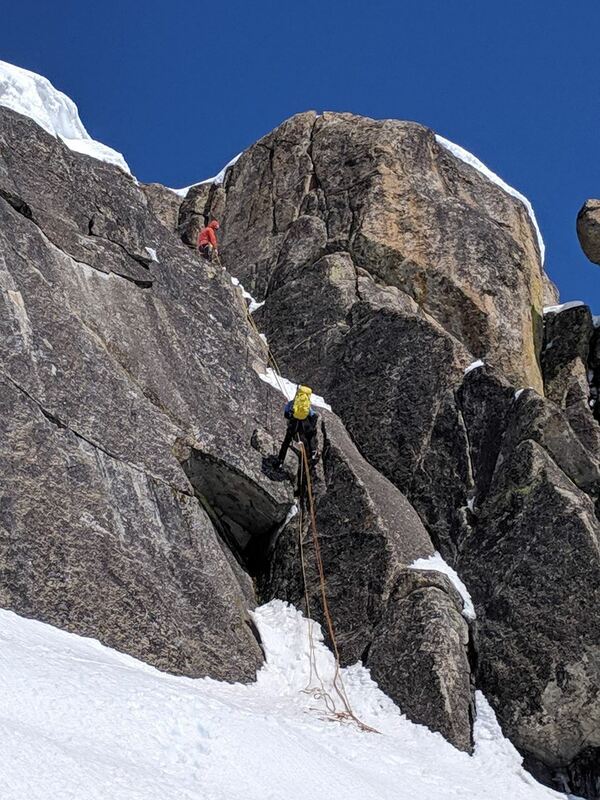 In addition to learning this, MAA provides comprehensive training how to use ropes, team self arrest, place protection and be a member of a team for this type of "ice climbing" in our Snow 3 and Snow 4 classes. Which ice axe to choose? How do you know which is the best one for your chosen application? Outdoor Gear Lab is a trusted source on all kinds of gear; here is an excellent review of all piolets classified as "ice axes" - which is all straight shaft or slightly bent shafts models, which are good for everything from mountaineering to steep hard snow and even low grade water ice. While alpine ice season is underway, the biggest mountains in North America are coming into shape. 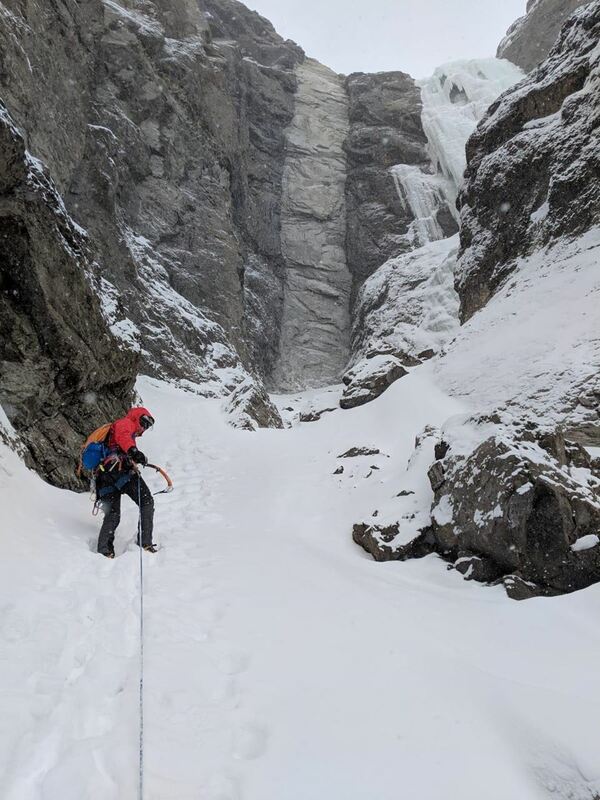 Sometime around May, and continuing into the fall, ice climbing now expands to include the glaciers and high mountains, full of glacial ice, tumbling seracs, and snow and ice in all it's wonderful forms. The technique we practiced in the winter and spring can be applied to the steep, hard slopes of many glaciated mountain faces and aretes. Think Mt. Rainier, Mt. Shasta, Mt. Baker, and Alaska. And it's not over yet...right about the time the crevasses are too numerous to negotiate, usually around September, we can return to the high peaks for a few last ice climbs until November. Nothing like a Halloween climb up the North Couloir of North Peak. The firn that has been hardening for many months is now dense, dirty, rock-hard snow. It will take ice screws and climbs almost like water ice, with much less shattering. We can touch the summits once more before winter closes in and the cycle begins all over again. And if this wasn't great enough, if you can travel north (or south) far enough, or high enough, in any season, you can always find "ice climbing". All types. Guaranteed. You just need to know where to go. 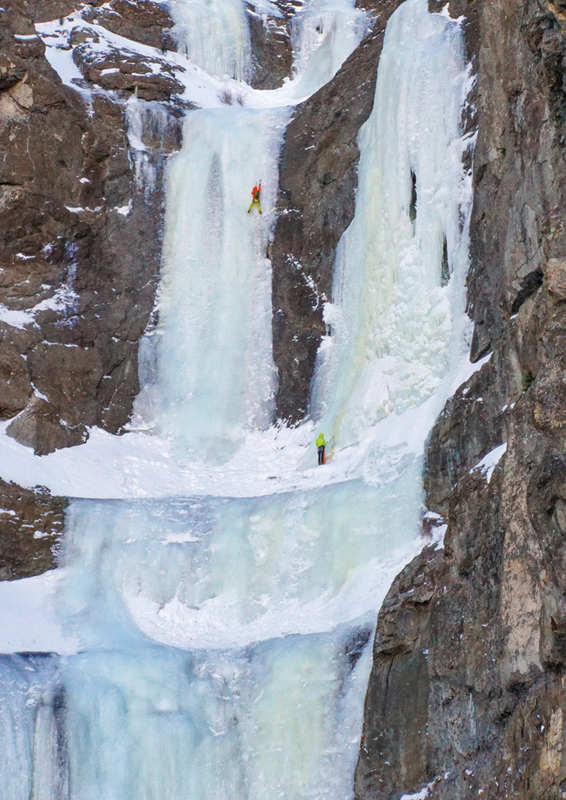 So you see, ice climbing season is never truly over. Keep your tools sharp! It's an icon of northern California and one of the most sought after summits along the west coast, 14,180' Mt. Shasta. 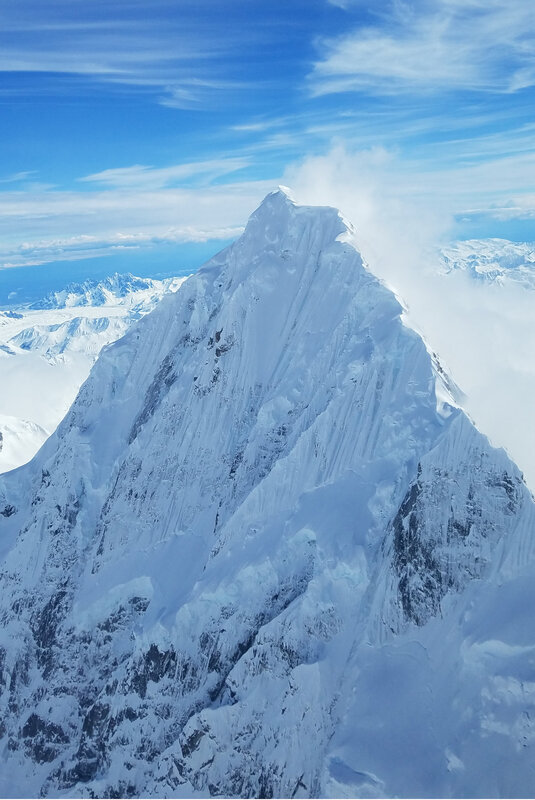 This prominent volcano offers excellent opportunities for climbing, skiing, and hiking on it's glacier clad slopes and one of the best summits anywhere - a small castle of rock with a sheer drop on all sides. 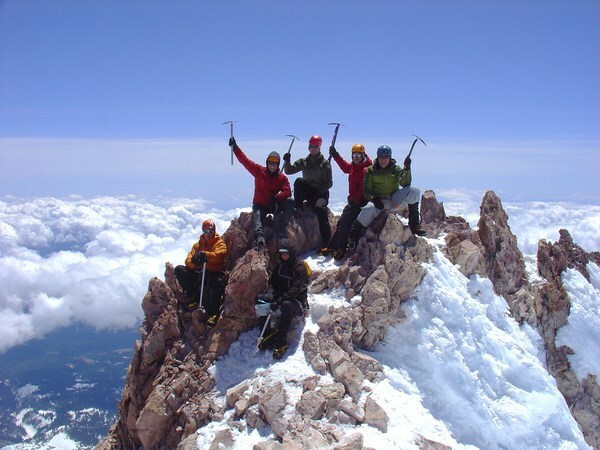 Mountain Ascent Association has been climbing Shasta since the very beginning in 2009, and to date we have logged close to 40 trips there, climbing all the major routes. I'm often asked about Mt. Shasta, when to climb it, where the best routes are and how to prepare for success. These are topics we discuss in our Mt. Shasta Seminar which you can view on our YouTube Channel here. However, some highlights would be appropriate, let's do them in a FAQ format. 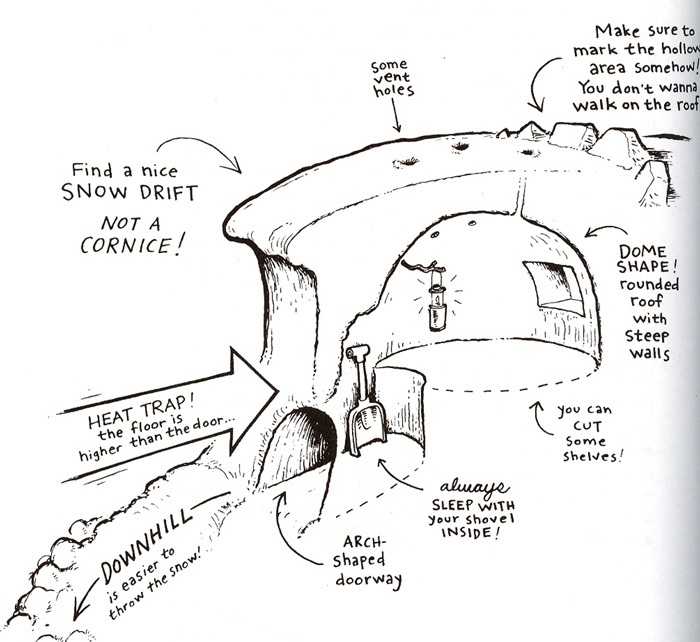 Q: Should I climb Avalanche Gulch? 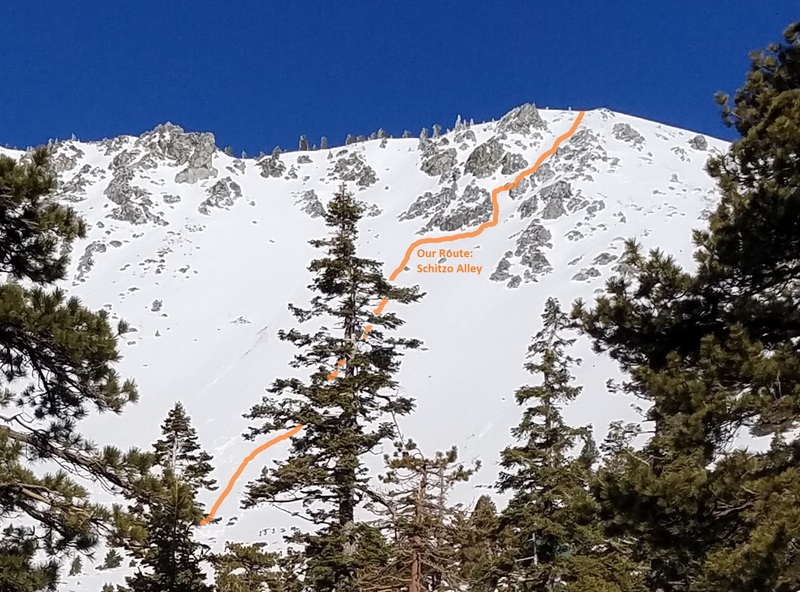 If you've never been to Shasta before Avalanche Gulch is a good route to ascend because it's one of the easiest routes. However, it is crowded and prone to ice and rock fall, plus the perils of the mistakes of ill-experienced climbers. For those reasons I recommend the West Face or Hotlum Bolam Ridge routes instead. They require a bit more travel and have more routefinding components, but are far less crowded, more scenic, and ultimately more safe. 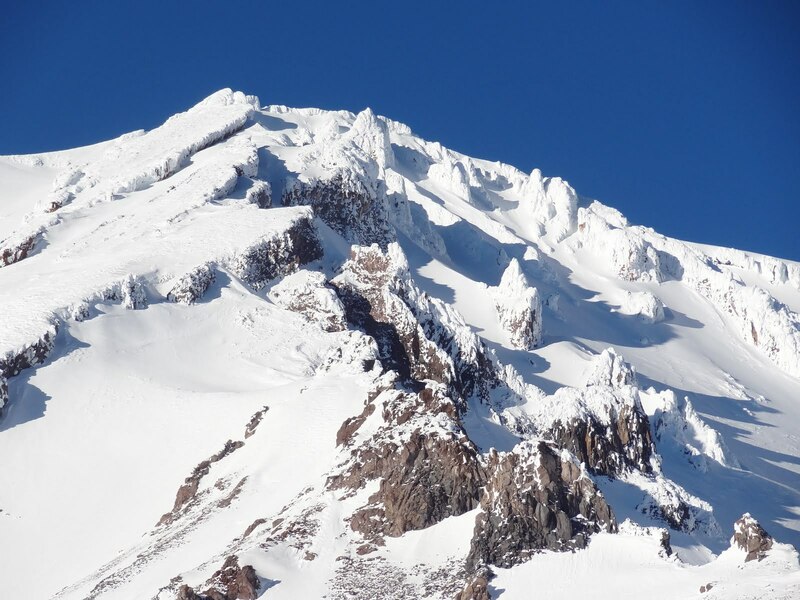 Q: What training should I get in order to climb Shasta? You absolutely need to know how to climb steep snow and perform an effective self arrest. In MAA, these skills are addressed in SNOW 1 and SNOW 2. You also need to know how to travel, camp and navigate in snow. These skills are addressed in MTN 2 training course. 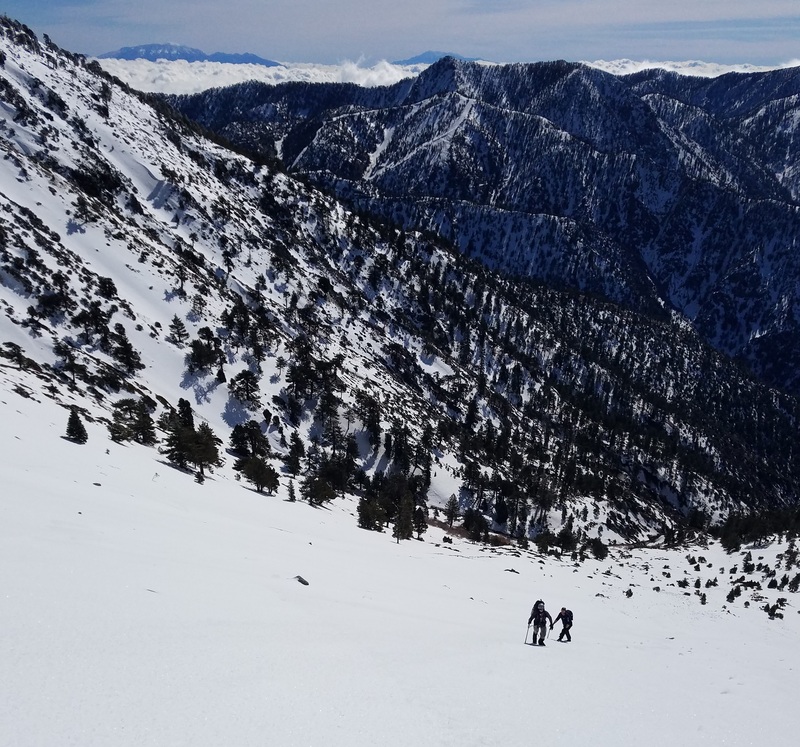 You do not need to have this training from MAA, you just need to be have the skills to climb the steep and slippery snow slopes confidently and safely. 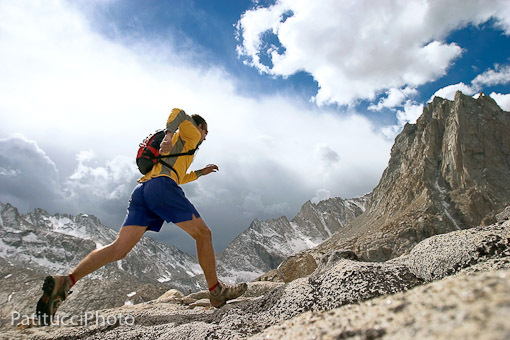 Most importantly, you need to be fit enough to climb a minimum of 4,000' per day with a pack at altitude. You should not expect to succeed by just jumping off the couch and heading up there. Put in at least two months of cardio training prior and you'll be much happier and successful on your ascent. Q: I want to climb Casaval Ridge. What's the best way to prepare for it? Casaval Ridge is a scenic route and is best done in the spring - April is usually the best month. However, since it is climbed on the coattails of winter, and because it is a prominent southern facing ridge, you should expect and be prepared for monster winds. They've been known to blow camps right off the ridge. 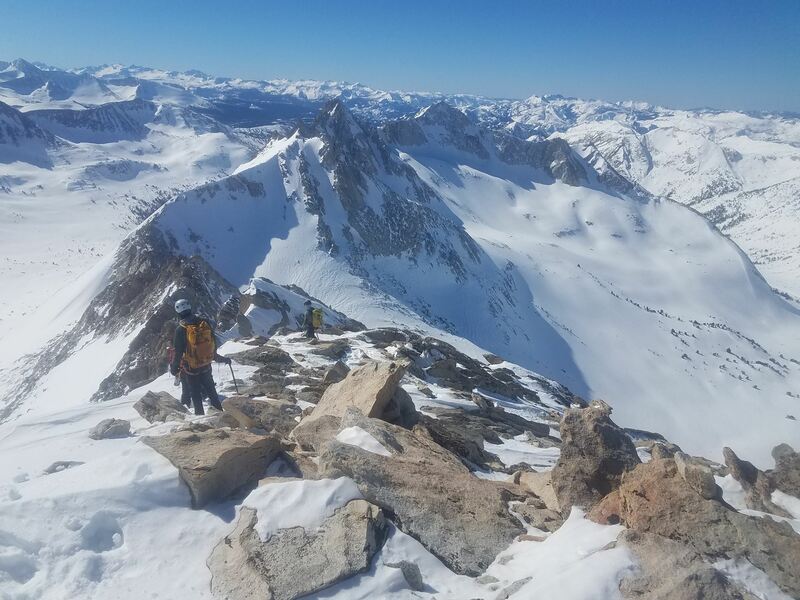 Over the last 7 years about half of our teams have been unable to summit due to high winds and low visibility, so take a healthy dose of patience and caution. If you are really committed to summiting via Casaval it's best to plan at least 4 days. Study the route carefully ahead of time, get a very early start - like 2 am - and climb fast. Most parties do not rope up for the Catwalk. 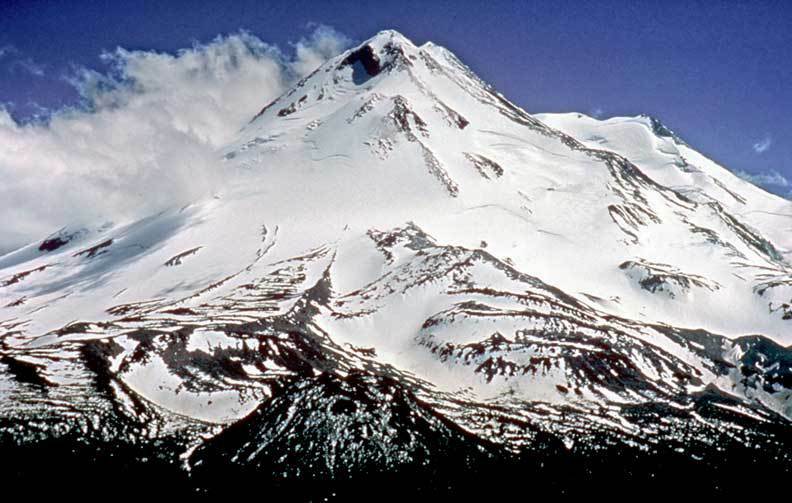 Q: How often does MAA climb Shasta? 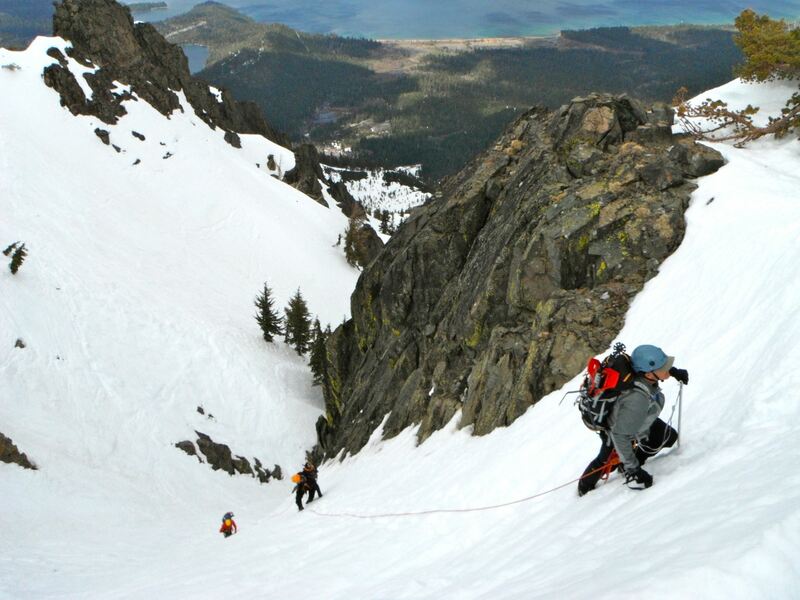 Mountain Ascent Association climbs Shasta every year, between 4 and 8 times, during the months from April - July. This year we have 6 events so far and a few more in the planning stages. 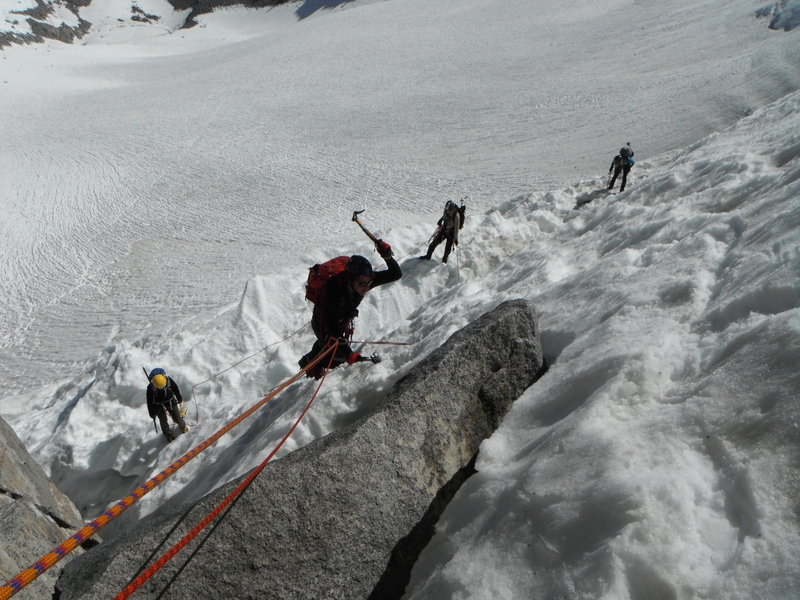 We also conduct glacier climbing and crevasse rescue courses there for Apex members. Our favorite routes are any Hotlum route (HB ridge, HB glacier, and left and right ice gullies) and the ridge routes (Casaval, Sargents, and Green Butte), with West Face as a great alternative to Avalanche Gulch. We'll also be on the Wintun glacier this year. 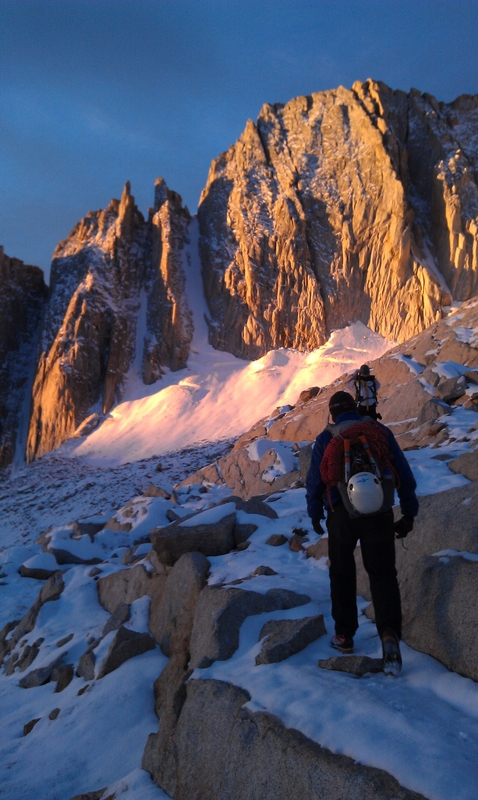 The Whitney Glacier is another route we've climbed in the past that is an adventurous and worthwhile route. 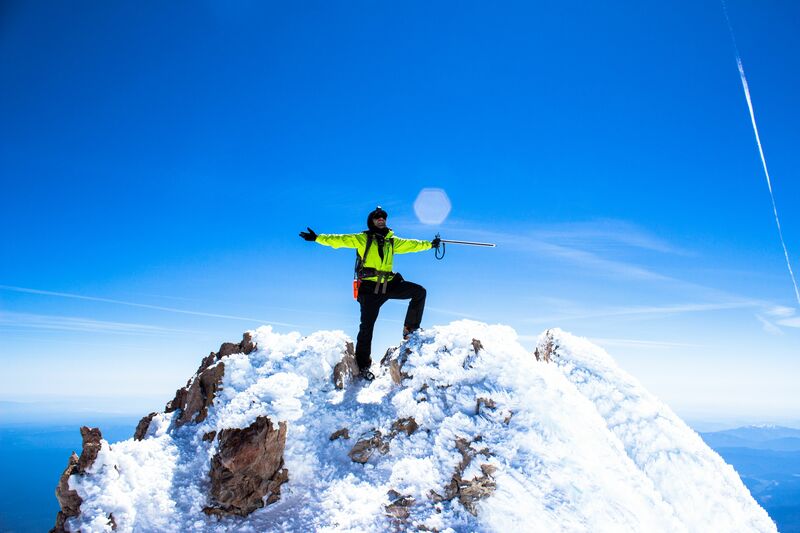 Q: What are the main hazards of climbing Shasta? Unquestionably the biggest hazard is wind. It can be unpredictable and not on the forecast. It also varies in intensity depending upon which side of the mountain you are climbing. The worst culprits seems to be the windward southwest side and the colder, glaciated northwestern side. 50+ mph winds have often been present on the Hotlum Glacier and Casaval Ridge and on the summit 100 mph winds happen often, especially in the winter and spring. Winds will not only make the climb colder and miserable, they may create a whiteout where navigation is difficult or impossible. Be prepared to descend and know your descent route well, even to the point of having a compass bearing handy. 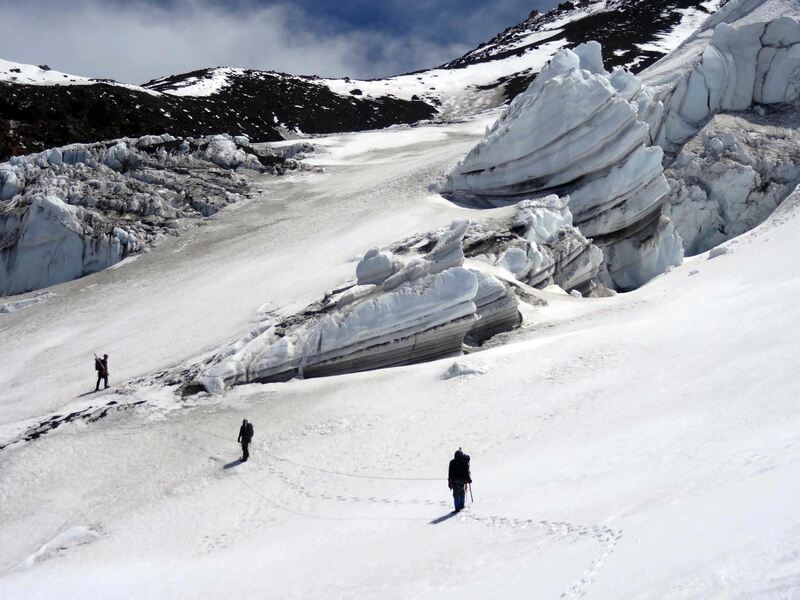 The other hazards of the mountain are other climbers, falling in or glissading into a crevasse, glissading with crampons on (never do this) and falling ice and rock. Q: What are the best things I should expect from my climb? There's a lot to expect! Mt. Shasta is a beautiful, accessible, high mountain with a variety of routes and a lot of room for everyone. The weather is usually great and the views are stunning. It's easy to get there on the interstate, and usually can be climbed in a weekend. Shasta is a great mountain climb in its own right, but it also offers the perfect training ground for higher and more difficult objectives. It's the perfect "mountain gym". Shasta is just as accessible as Mt. Hood or Mt. Baker, but it is hundreds of feet higher at 14,180. Rainier is the only Cascades volcano that's higher, at 14,410'. However, unlike Rainier, Mt. 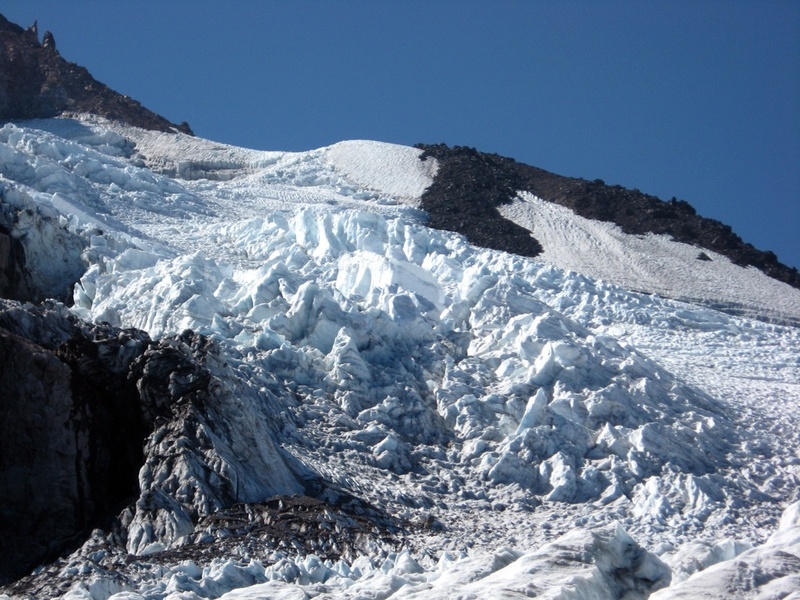 Shasta is less serious and less massive, with only a few glaciers that are big enough to practice with, but not so big they are a major hazard. So it's high enough to be useful for a "high altitude" experience but small enough that is doesn't require a major expedition effort to climb. Q: Can I climb Shasta on my own? Yes...if you have the skills, fitness, and a partner. Don't head up there without all of those. Study the route ahead of time, monitor the weather, don't skimp on clothing and equipment, and be ready to turn back if things aren't right. But do go for it - you will be rewarded. Climbing Mt. Shasta is a stellar experience. This past weekend we had planned to do a winter ascent of Mt. 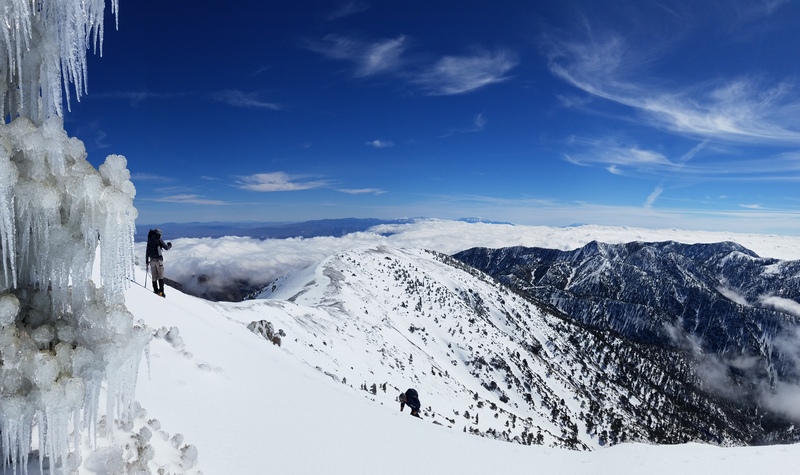 San Gorgonio here in SoCal, but due to bad weather opted for a day climb of Mt. 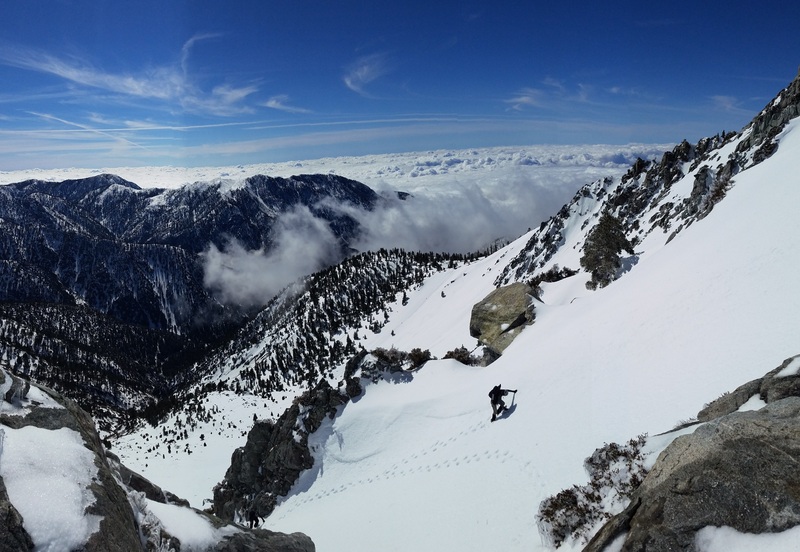 Baldy via the longest chute in the bowl - Schitzo Alley. Kevin, James, and I (toad) met at Manker Flats around 7am and on Sunday, March 3rd. All of SoCal was socked in with clouds except the mountains. Gorgeous day up high! We were stoked to be there! After a quick ascent to the ski hut where we geared up, we got to climbing an avalanche scar (avy from previous weekend) on our way up the bowl. A ton of ice-gravel coming down the bowl, ice pin-wheels, and some decent sized rocks. Was a very headzup climb. Once at the base of the rocks we traversed east and into the Schitzo Alley chute. Lots coming down the chute including some soft snow, so we hugged the sides for safety. Near the top of the chute we found the source of constantly-raining-ice. The storm that came through the previous day had a very high freezing level (around 9300') so all the rocks and trees were fully coated in ice that was now peeling off in response to sunny-day rising temps. Made for some great pictures though. We topped out around 11am, tagged the summit, and skeedaddled to escape the high winds (blowing 35+mph). After stopping for grins at a great viewpoint on the ridge, we continued down into the now rising cloud layer and back to the TH by 2pm. Was a shweeeet day!! Our route up Baldy Bowl. Fun line! Getting started up the bowl. Nearing the top of the chute. Ice coating everything up here. Topping out. Now just 1/4 stroll to the summit. 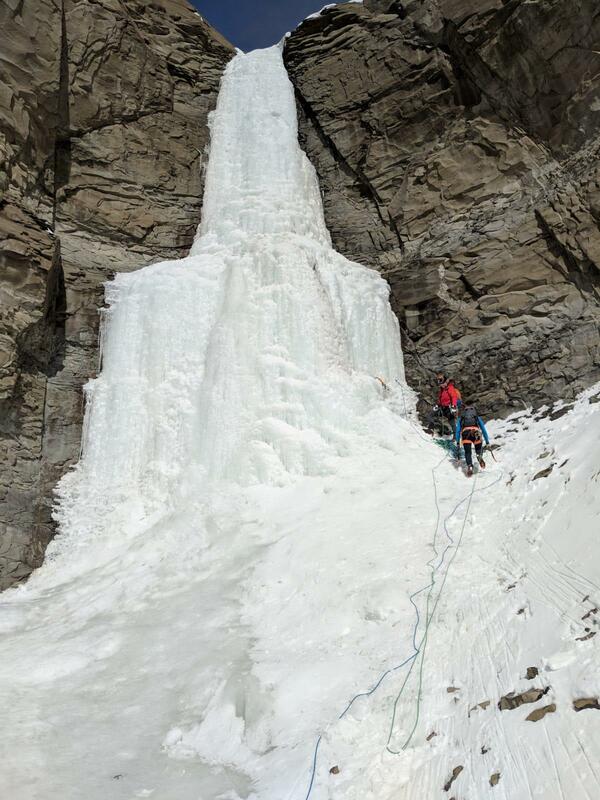 MAA members just completed an epic week of ice climbing in the frozen northern region of Cody, Wyoming -- and have confirmed this as the amazing multi-pitch ice climbing playground it's famous for. The team completed multiple, long routes in the WI4 - WI6 range, notably "Broken Hearts" and "High on Bolder". Temps were brutal, bottoming out at -11 and below zero on most days! The team stayed in a rural cabin which MAA has secured for next year. 2020 dates for the Cody expedition are Feb. 27th - March 4th. Hope you can join us! 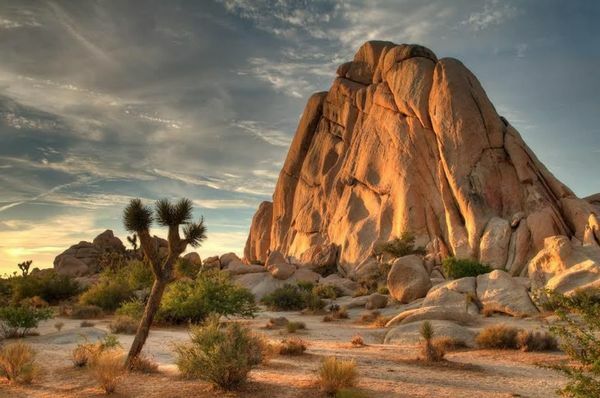 Joshua Tree - This National Park located just a few hours east of the Los Angeles sprawl is renowned for great weather in the "off-season" - in fact November through March is the best time to go there. J-Tree has thousands of routes on rock with incredible friction and some very unique desert scenery. It's busy on weekends so try to go mid-week if possible. There are so many areas to climb there, but some of the best are in Real Hidden Valley, off the Lost Horse Road, and at Hemingway for example. MAA sponsors trips to JT a couple times a year, mostly in the fall. Go check it out! Red Rock Canyon, NV - This area just outside and in a completely different world than nearby Las Vegas is famous for multi-pitch climbing on amazing sandstone. You can also find some cragging areas and even great hiking here. Finding camping is relatively easy and there is lots of room for everyone with dozens of canyons and hundreds of routes. 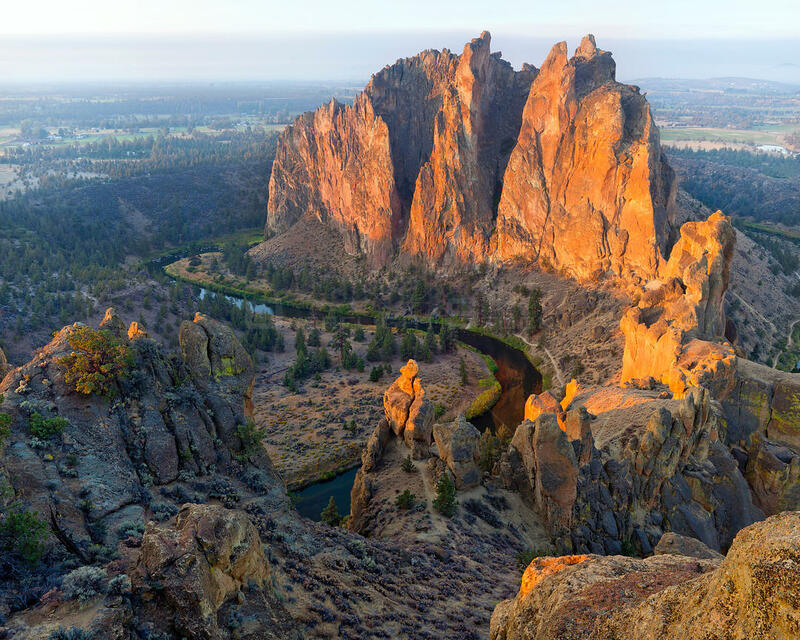 Smith Rock State Park, OR - Just outside of Bend, "the birthplace of sport climbing" was created from the enthusiasm of the climbing community and remains true to that heritage. With accessible camping (with a bathroom and showers! ), an excellent trail network, generally excellent weather, this place is a mecca. Thousands of sport routes and a handful of trad routes in the widest variety are available all over these unique formations. 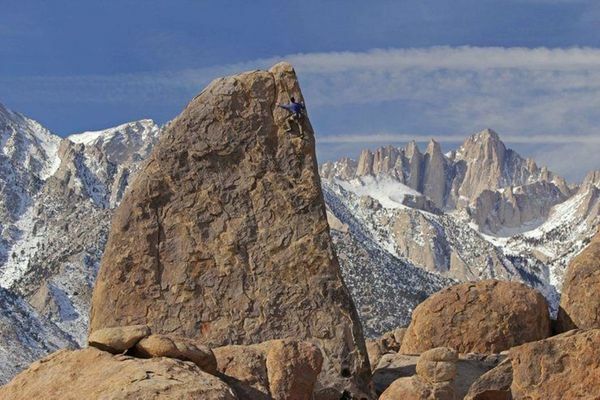 Eastern Sierra Crags - A number of locations here are significantly more tolerable during winter than summer: most notably Alabama Hills in Lone Pine, the Buttermilks, and Owens River Gorge near Bishop. Mountain Ascent sponsors climbing events at many of these locations every year. In 2019 we'll be at Smith Rock in May and Red Rocks in November, so far. J-Tree and other areas will certainly pop up as we get closer to summer. Check out Mountain Project for more information and other ideas! Winter "Fast and Light" - Does It Exist? Yes, Virginia, winter "fast and light" is real - and in fact has made many appearances, even on typically "heavy and slow" expeditions! How can you be light and fast in winter without cutting the margin of safety razor-thin? And just because you are light, does that mean you are automatically going to be fast? How about these tips from the front line. Get fit. 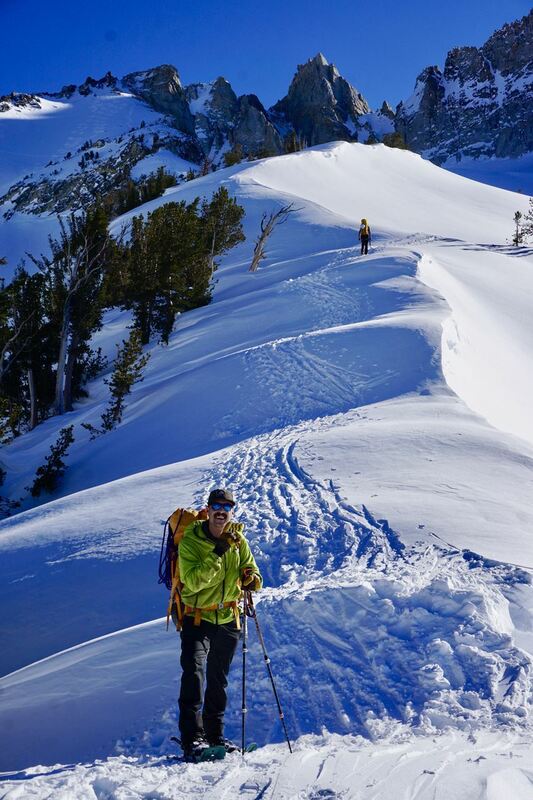 Winter climbing is demanding - heavier loads, deep snow, cold temps...it can be tough. Be prepared for it by following a fitness training program that includes cardiovascular endurance and some strength training. This will allow you to go further and last longer. Apex and Peak members both have climbing specific training programs included in their membership, take advantage of it! Practice Multi-Use and Limit Duplication. Sleep with all your clothing on and you can bring a lighter weight sleeping bag. Bring only one torso length closed cell foam pad and use the rope and your backpack under you as additional insulation from the cold. Maybe this will in turn allow you to bring a smaller and lighter backpack. Only a few items should be duplicated: socks, gloves and headlamps in particular, and see if you can get by with only two pair rather than three. Winter is not the time to bring the coffee press and camp chair. This can save you a pound or two. Cut down on food, and make careful selections. Yes, it's scary to contemplate running out of food, especially in winter. And you need calories to stay warm, so it's a safety thing too. But this is an area where folks routinely bring more than they need, and even return from the trip not having eaten it all. If this is the case, you probably brought too much. Consider bringing the most calorie-dense items you can, with raw BTUs as the criteria - this is not the time to be on a diet. (Bacon is one of the best for calories to weight ratio, for example!) Also, remove packaging and only bring what you are actually going to eat. Plan it out for each day. Unless you'll be further than a day's journey from the trail head, there is no need to bring "extra food", just in case. The average person can go an entire day or more without eating if necessary, you are going to make it. With careful planning and bringing no more than 3.5 lbs of food a day this, could save you many pounds of unnecessary weight. Don't carry so much water. It's important to stay hydrated but take care of that while you are in camp or by filling up at streams, if possible. You probably only need to actually carry a liter or two at a time. Each filled Nalgene (quart) weighs over 2 lbs. And when you do drink liquids, opt for hot drinks! All these concepts are taught on the MTN 2 training course offered by MAA in winter time. Hope this helps keep the loads lighter and the smiles bigger!